Stop! Read our updated blog for 2017! 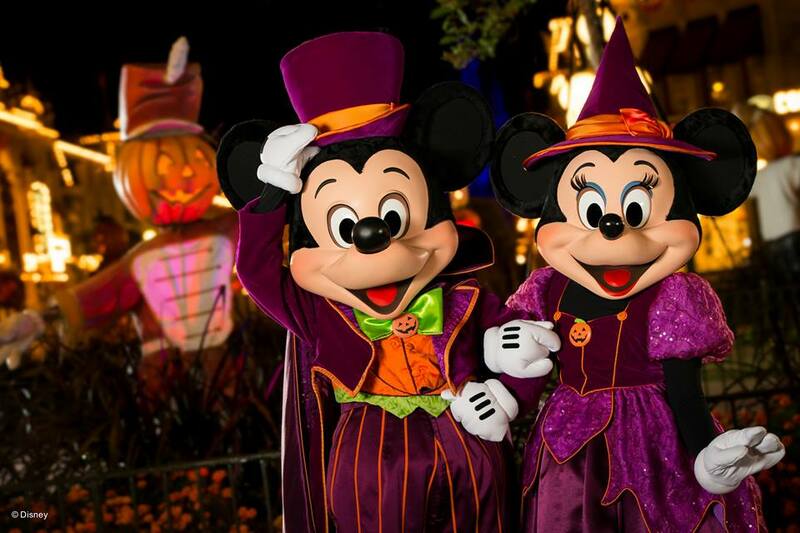 May 2016: The dates and ticket prices for 2016 Mickey’s Not So Scary Halloween Party have been announced! There are 29 nights to the 2016 event this year! WARNING: Huge increase in ticket prices this year!!! So fun! Taking photos in our costumes on Main Street USA. 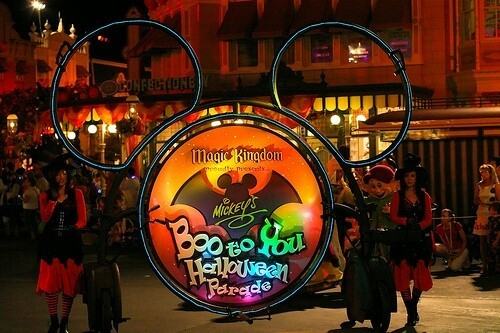 CM Tip: The party starts at 7pm, but Disney let’s guests wearing costumes in for the party starting at 4pm. 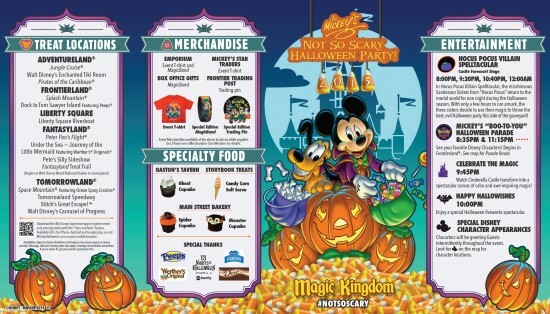 Plan on going to the Magic Kingdom early and storing your costume in the lockers near the entrance. 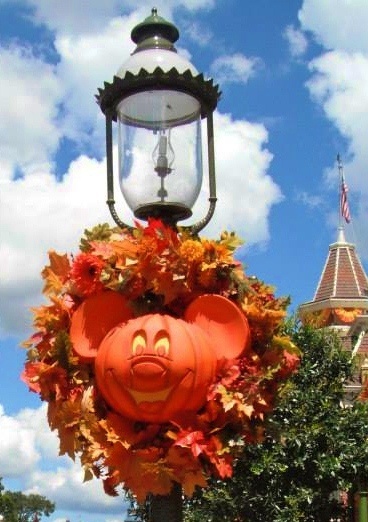 At 4pm, change into your costume and have your photo taken on Main Street! 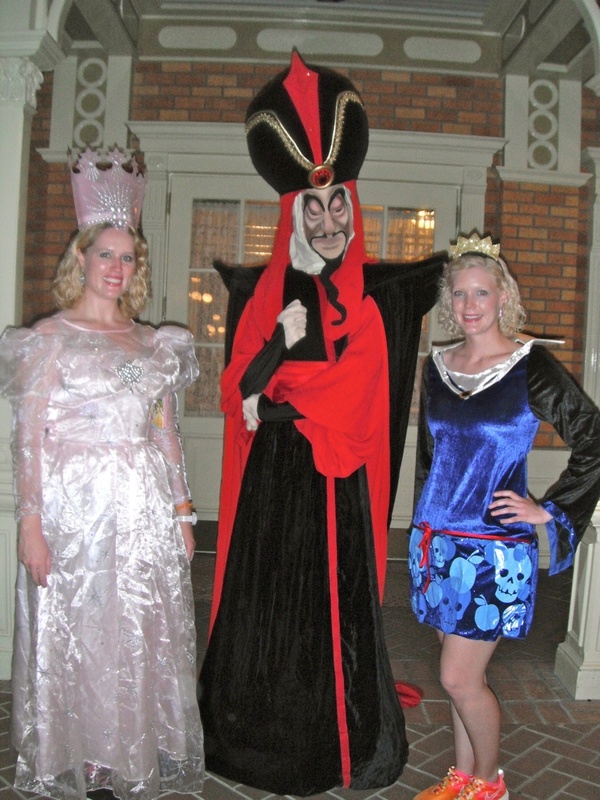 We have revised our costuming guidelines for special events in our theme parks. 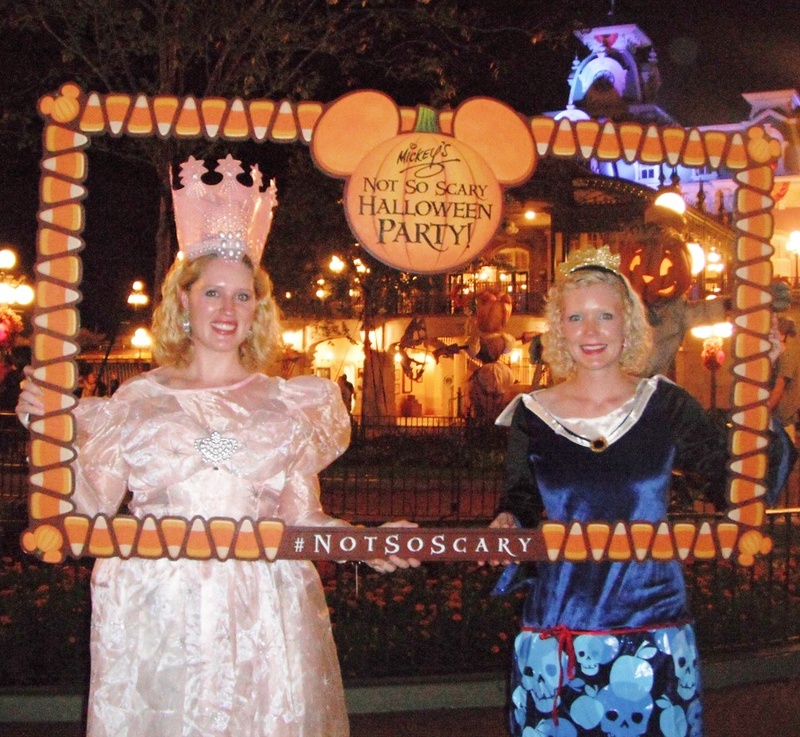 While costumed attire may be worn by all guests to the event, guests ages 14 and older are strongly discouraged from wearing layered costumes or costume props that surround the entire body as they may be subject to additional security screening. Additionally, costumes may not contain any weapons that resemble or could easily be mistaken for an actual weapon. We love the Boo to You parade! It’s held 2x/night. 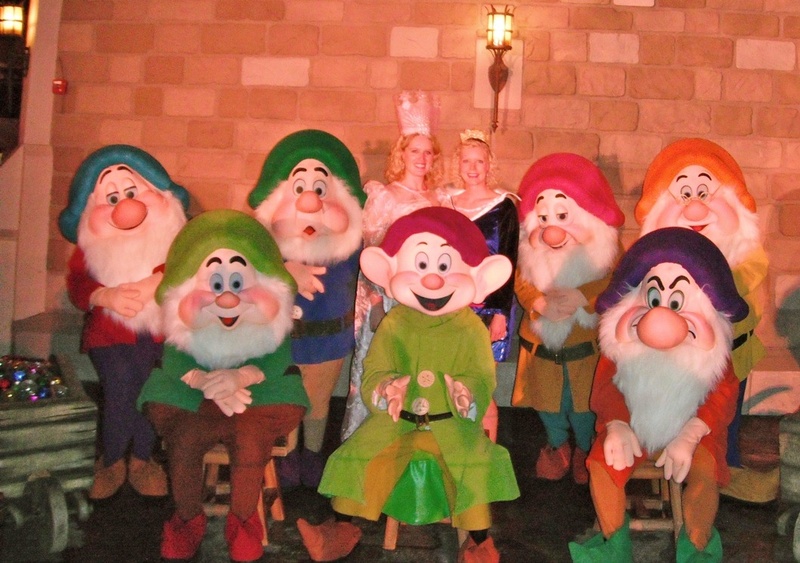 We got to meet all 7 dwarfs during the last MNSSHP party! 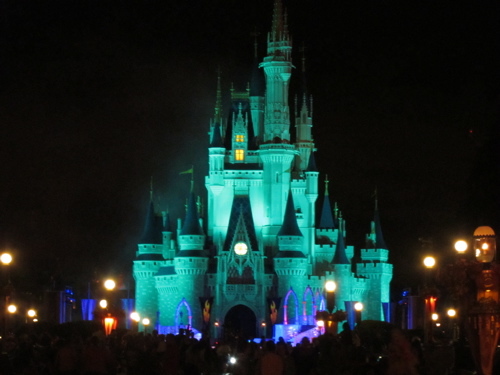 Cinderella Castle in Halloween colors with “fog” rolling in. 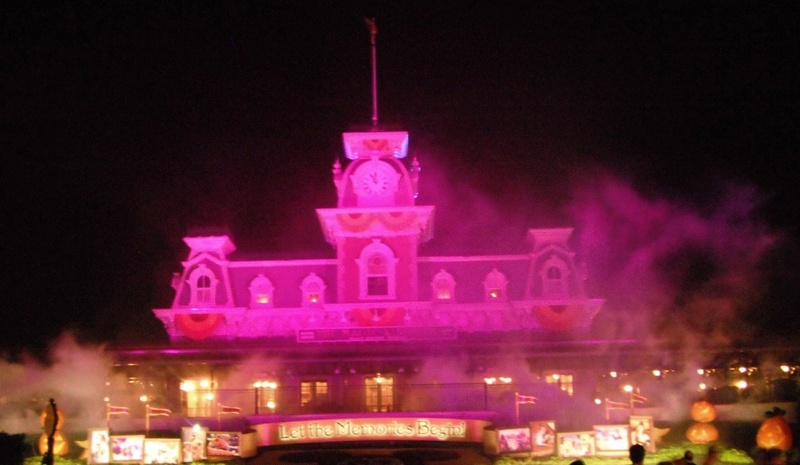 Spooky music and lighting and fog throughout the Magic Kingdom on Halloween Night. Make sure you stay until midnight!! 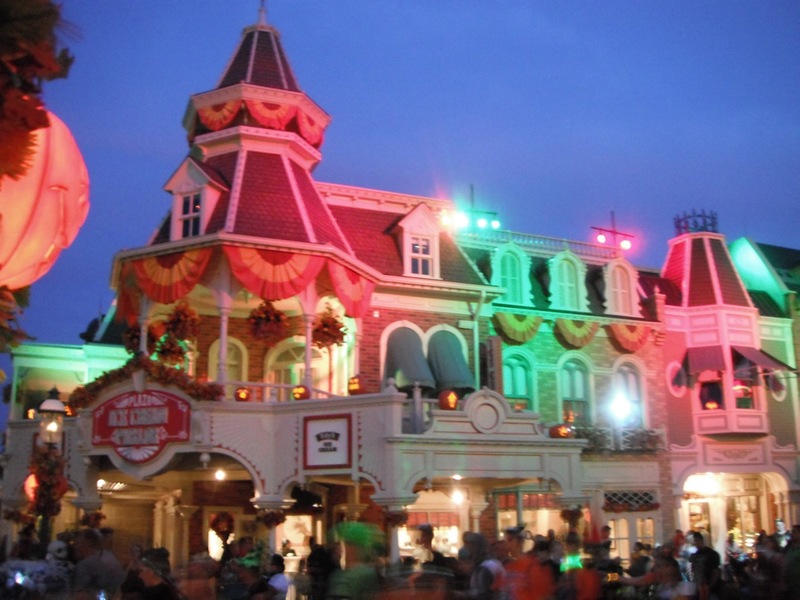 Main Street USA is so pretty during the fall! Decor goes up by Labor Day weekend. There will be free Trick-or-Treat candy stations! All the fun party stuff! The last big event that we planned to attend for Homecoming was the big party at Disney’s Animal Kingdom. It was originally set to be at Hollywood studios, just like the last year’s event. But I was totally excited when they announced that it would be moved to DAK! At first, they said the party started at 8:30, but you could get in at 7 to hang out. Then, right before the weekend, they announced that you could get into at 3 so you could have time to enjoy the park! Really, so nice and thoughtful! We got there after dinner and had some time to walk around my two former homes at Strollers and Discovery Island. I LOVED seeing the new charges with Discovery Island. Outfitters has been changed to open up a larger/wider store called Riverside Depot. And they filled all the merchandise in Is,and mercantile with Outfitters. 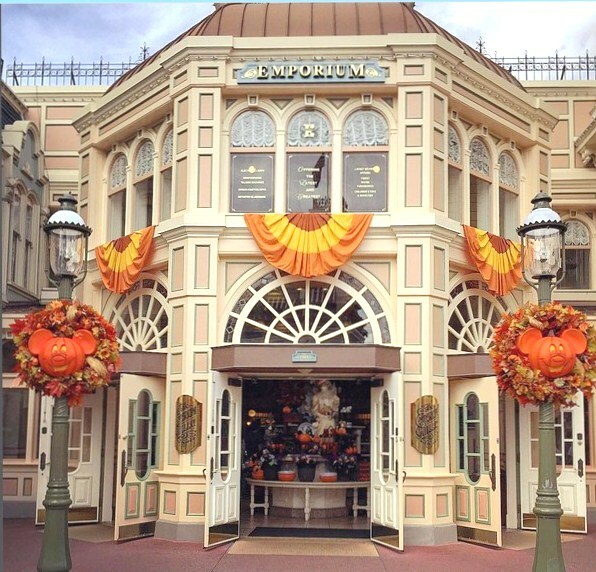 I loved how they kept with the theming of the two stores. And I love how the Depot is like a dark blue – my favorite color! There is also a huge glass mural behind the register. Very nice! And I like how they changed the register setup to be more similar to the stores in Disneyland. After taking some pictures of the Tree of Life, we met up with Ricky and headed to Africa! The first part of the night would be a vip showing of Festival of the Lion King so we tried to stick around the entrance of that so we’d get a good spot. Right before they allowed us to move in, our friend Kelsey found us again! Everyone started filtering in so we did too. It was a total surprise when we looked around and realized we somehow were the very last people into the arena! So much for good seats! We ended up getting a good spot, right in front of an alumni group from the 80s. They kept chanting “retro” or “vintage” and were such a rowdy bunch, it was hilarious! They had is wilderness guy as the emcee and he was pretty funny. He told some dirty jokes which I was surprised about! We did notice that most of the winners were from the older generation of the CP. Marcie to,d me that here wasn’t anyone from the very first program in 1981 attending, but there was one person from the 1982 program. He was the one to win the grand prize. They played for a little bit then pulled audience members for a dance along. It was pretty fun, but it would have been more fun to be a participant. Just when I started getting worried that this was the extend of the event, they finally announced that the Festival of the Lion King was about to begin! Yay! 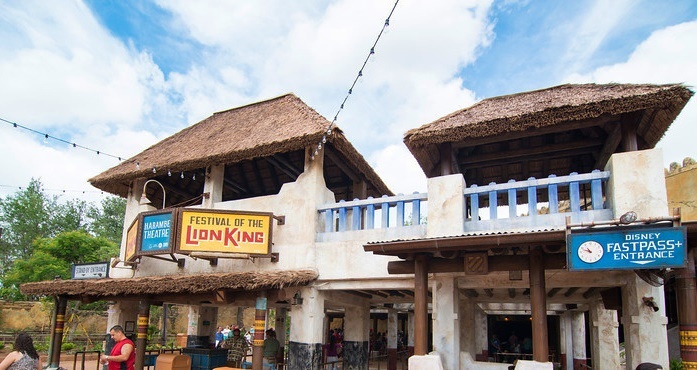 After the Festival of the Lion king, they announced that there were be tons of food, special character meet and greets of King Louie, Balo, and Rafiki. We all agreed we were ok missing that since we see them all the time at Dak! There was also free henna tattoo artists and also a fortune teller. We came out and immediately got in the food line. The snacks were so good! There were little corn dogs, cheeseburger flavored wraps, and WHOLE soft pretzels with melted cheese dip! Yum!! We got all the way through the line and saw the pretzels were out. And we literally didn’t move until the brought more out. Haha the line was so long, but really, we were doing them a credit because the best part was missing! They must have had them cranking, because within a minute, they brought 50 more pretzels out. We sat down and ate our snacks. So good! Then we took some Dak pack pictures in our new shirts! We made our way to he dance floor and I took one sip of my drink. The bartender had floated the alcohol instead of mixing it and the second it hit my throat, I knew there’d be issues. I have super reactive airwaves and tend to choke on liquids all the time. I have taken to warning new friends since its been happening so frequently. I’ll slightly choke on something and then my throat will close so forcefully that I sit there, trying to cough and breath for like a minute or so as tears are streaming and I feel like I’m dying. Well this happens right there, in the middle of ten Africa dance floor. I start really choking. And I still have a good mouthful of drink in my mouth. And I’m trying to figure out, should I spit it back into my drink, should I spit it out onto the ground? I was in the midd,e of the floor and my bright hair draws some attention and I was feeling so embarrassed. I’m trying to cough and swallow without opening my mouth and all I’m doing in a circular motion of accidental swallowing, choking more, coughing more. Ok, this went on for longer than a minute. Keys,eye was getting nervous, Elly was getting nervous, I thought I was dying. Oh my god. Finally, Elly kind of screamed “Caroline!” Which distracted me enough to just force all the liquid down my super tight throat (still going the wrong way down) and then I had to go to the bathroom to hack a lung for a good 10 minutes. My face was all red from not breathing and also embarrassment and my makeup was ruined from all the forced tears from coughing so hard. Ugh literally can’t take me anywhere. We danced, we eat some Rice Krispies we found and Lesley hooked us up again by finding a guy handing out the cool buttons! We did a lap and it was so funny – we found this long line in the back of Africa and we were like “oh cool, what’s here? !’ So we just got in line. We finally asked what people were waiting for, and everyone screams “the exit! !” Hahah the longest line here was to leave! By then, Kelsey and Ricky had to leave. Good thing, because it started pouring and the DJ had to go away and all the characters had to go in. They opened up Tusker House which I was thankful so we didn’t get drenched. Plus I’ve never been inside there, so it was fun to explore! We sat down and met some really nice girls who I’ve been Facebook friends with but never met. So nice! And then we were totally surprised when the characters came inside! So instead of waiting in a giant line, we just met them right away! Once it stopped raining,around 11:30 we were ready to leave. We headed back to Rafiki’s train and saw they were separating people in several lines. Contemporary, Coronado, and Main Entrance. Instead of allowing us to just walking through to the front, we had to go backstage, on a Transstar to bring us to the front. They separated us into groups of 50 and we had to wait for half an hour for the bus to go. We were standing, and it was so packed! All I could think was how this looked exactly like the Transstar bus whenever Dak was open late. It took forever! We had to go all the way around backstage, past DaK Lodge, then down the road until we could do a uturn and head all the way back through the main entrance and around all the Dak parking. Ugh! The girl next to us got really sick and was pressing her face against the window and standing between some strangers legs. She must have been really desperate because you know how gross those windows are! We had to cross two parking lots to get to our car and then we were finally on our way home! Elly and I agreed this was the worst part of the weekend. It took us more than an hour and a half just to leave/get out of the park! But, this whole day as been amazing! I can’t believe how perfectly everything worked out and how great the whole weekend has been! We didn’t go to bed until after 1:30 in the morning. Hopefully we are sleeping in tomorrow! Our time slot was 10am-11am. I wanted to get there a little earlier because we had our park tickets in will call and I was worried they might close off the lines early. Of course, that didn’t go as planned! We got home so late the night before, plus with the 2 hour time difference, it was slow moving the next day. Mi am a morning person so I had no problem getting up early. My after showering and getting Elly up, I walked over to the Old Key West quick service to get some kids’ egg breakfast plate. Still, we didn’t get out until after 9:30. Min was really stressing out about it because I was going to be pissed if we showed up too late and missed the event! As I waited for the bus, I checked the Alumni Facebook group and immediately saw Marcie’s post about there being issues with the event and how she was going to refund the $10 fee for it! I was SO worried because it sounded like the whole event had been canceled! And then when I saw which characters were there, I was REALLY stressing! But Elly and I agreed to just show up and hope for the best. Of course, we didn’t bother to stop to ask any cast members – no way they’d give us correct directions! Haha. But it turns out we knew the building, if not the name. It’s the giant empty building next to Test Track and Mexico. We love going there because the bathrooms are always clean and empty! When we got there, we didn’t have our Alumni Event lanyard and weren’t wearing our bands to indicate that we paid for this event. Luckily we brought all the wrist bands and quickly showed the lady. She informed us that there were two character lines – Jack, Sally, and Oogie Boogie from Nightmare Before Christmas and also Dug, Russel, and Carl from Up! Yes!!! Elly and I got to meet Mr. Fredrickson when we extended our program in 2014. I was totally surprised when I got home and saw on Facebook, that I literally met them on the same day, just two years later! So cool! We walked into the room and it looked pretty crowded. We immediately located and warmed the free food. Entire buffet tables filled with Mickey rice crispy treats and then all the ice creams : Mickey premium bars, Mickey ice cream bars, the fruit bars. Yay! And there were really nice party drink containers filled with yummy juice, iced tea, and water. Right away, I ran into my friend Steven. We actually did our program together at Dak, I was at Discovery Island and he was at Strollers. We never met or ran into each other, but we had a lot of mutual friends since a lot of Strollers people were deployed to the Island. Once I got accepted for the Summer Alumni program in Strollers, I friended him to ask him tons of questions about Strollers! He was always so nice so I was glad we ran into each other to finally meet in person. 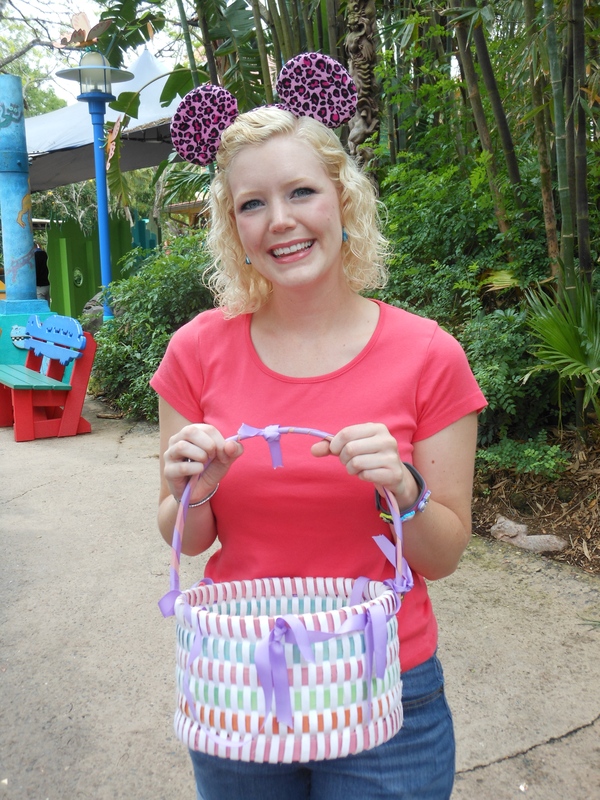 As I was perusing the food, I heard my name and saw my Strollers friend Kelsey in line for the Up characters! Elly and I got in line with her and started catching up. Apparently there was a huge snafu with the Homecoming Transportation. As in it never showed up for the 9am people. Who still hadn’t arrived by the time we got there after 10am. No only that, but the food had run out and people were really pissed out it. A lot of people posted in the group that they had gotten through the line for the NBC characters and then tried to get in line for the other set, and the event staff kicked them out of the event! I guess I can understand the thinking behind it because there were still people coming home hadn’t met any characters and the characters were only there for two hours. As we were waiting in line, a couple really nice girls in front of us and behind us recognized us and talked to us about how much they like and appreciate our blog! It always surprises me and makes me feel so great when people are so nice! We talked with them the entire way through the line and even became friends on Instagram! We finally got to the front of the Up line and I was so impressed with the setting! It was framed with giant multicolored balloons and it even had Kevin, peeking out from behind some trees. I hugged Dug and Russel and shook Mr. fredrickson’s hand. So funny. After we got out of that line, I got up some courage to talk to Marcie! I saw her a bunch yesterday, but I didn’t realize it was THE Marcie running the Alumni Facebook group! I went up to say hello and to tell her how much I appreciated everything she’s done for the Alumni and how great the event has been! In the middle of talking to her, I hear my name screamed really loud! I look around and saw my friend Kelsey had gotten into the NBC line! I figured, it was so late, the lines were closed. But the attendants totally let us go! There were like two people in front of us so we met them really fast! Jack was so great, he said my ears were so sparkly, they should put me on top of a Christmas tree! He also appreciated my orange wristband because it looked like a jack o lantern! I also hugged Oogie and it was so fun. I never saw NBC before. 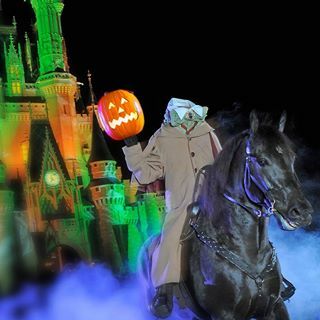 I have been to several Halloween parties and my favorite part of Hallowishes is when Oogie is talking. It gives me chills! So it was pretty cool meeting them! I couldn’t believe how perfect the event was! From our point of view, there were no issues! Despite my griping to Elly, it was actually really great that we were so late. The event was secretly extended to accommodate the later arrivals, but I think a lot of people just didn’t show up when they read the posts on Facebook. We left at around 10:45. If you didn’t have a park ticket, you were escorted out of the park by event staff. But we were free to explore! The first thing we did was go to the former Captain EO venue to watch the Shorts. It shows 3 shorts in 3D and it was really cool! We didn’t realize that the entire seating area moves too. So like when something heavy falls in the screen, we all thumped too. It was so hard to tell which short was our favorite – they were all amazing! We didn’t even have time for the World Showcase, and before we knew it, it was the afternoon! We had planned to go home to change before the big event at DAK. So we split off from Ricky and Kelsey and promised to meet up later that night. We decided to take 2 suitcases each since we were flying on southwest and bags fly free. I’d prefer only one each, but we knew we might be buying some good merchandise, plus I had to bring dress clothes for the big party at the contemporary. The flight was pretty good. It’s always turbulent between Denver and Orlando, but I guess I’m getting used to it because I barely noticed. I knew one of my best Disney friends, Ricky was also flying in, but I knew he would get in like 3 hours before us. We met up, hugged, pin traded at the Earport, and had lunch at the really nice food court in the airport. It was so funny because Elly and I purposefully wore our grey Alumni shirts and people kept stopping to say hi and talk about how excited we all were about going to this Homecoming! Ricky was riding in on Mears and For the first time, we did Magical express to get to our resort! Unfortunately, we were on the completely wrong side of the Airport, so we had to drag our 4 suitcases all the way back to the 3rd level, across the whole terminal, back down to ground level, then all the way to the end of the terminal again. There were several queues open to check in. Elly couldn’t figure out how to pre check in, so we just walked with our resort info and hoped for the best! It was pretty easy, he was able to pull up our info and because we were on the reservation, we just got some papers and were on our way. We got in another queue for all the buses lined up outside and were immediately put on the Old Key West/Disney Springs one. We were totally surprised when we got on that the bus was all the way full! We got all the way to the back of the bus, and there were two people sitting next to empty seats. They saw we were together and were super kind enough to move so we could sit together! When we got to Old Key West, our family friends Dan and Pam was so kind and actually met us at the bus stop! We got our magic bands and headed over to the room. Wow! The room was beautiful! Luckily it was close to the bus stop so it wasn’t too bad managing our suitcases. Because Old Key West is DVC, all the rooms are like suites. There’s the main bedroom with connecting spa tub, shower and bathroom. Then there is a HUGE living room, kitchen, and eating area. We were going to stay on the pullout couch. It was so funny because we immediately dumped out all our crap from our suitcases, trying to find anything and you could just see their faces at the mess…I immediately was like “Don’t worry, this’ll all be gone when you get back!” Our friends left to let us get ready for the party! We showered and got all ready, all the while texting Ricky to see what he was up to and when to meet. Poor Ricky – not only was his flight super delayed, when he got to the hotel, he realized that there had been a water leak and all the guests had to be put up in a different hotel. So they paid for his taxi to the new place. But when he got dropped off, he was at the wrong hotel! So then he had to walk a couple blocks over with two suitcases to the real hotel! And instead of being super close (near the Outlets), he was moved over 30 minutes away near the Orlando Eye! We were invited to attend this special DCP networking event before the real party, but I knew we wouldn’t be able to make that. Our friends were so kind, they left the car keys for us, so we went and picked up Ricky so he wouldn’t have to pay for a crazy expensive uber. We got to the Contemporary around 6pm, a little over an hour late. Luckily we were able to find a good parking spot even though it was super crowded. We walked in to the event and immediately checked in. We got our magic bands, shirts, backpacks, and wrist bands stating which events we paid for. Then we saw this huge red carpet to enter! So cool! But before we went in, we got stopped by two CMs with video cameras. They filmed us answering a couple questions like what we got our of these networking events and what we thought of the weekend so far. Pretty fun! When we walked into the party, we immediately found another one of my Strollers friends and grabbed a table. Elly and I were starving so we went to the big buffet set up at either end of the room. We were super surprised to see Mickey and Minnie in super fancy Gatsby like costumes. 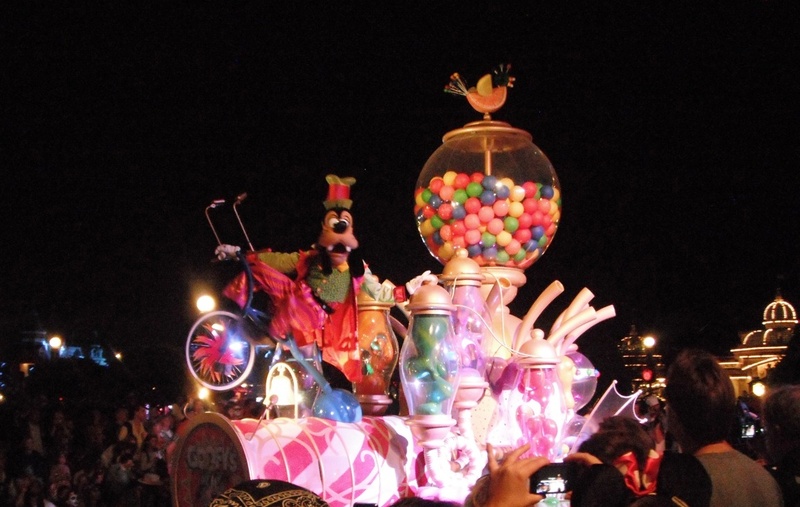 Donald and daisy were there and then also goofy and Plato. We ate and caught up with my friends. After eating, we decided to hold off on dancing to see Mickey and Minnie. I didn’t want to miss it in case they cut the line early. We walked over and there was 5 rows of people waiting! But we got in line anyway. In total, we waited a full hour to meet them! But it was so worth it! Next, we took pictures with Walt, then signed our names and locations/year on this giant poster. Then we saw this giant replica of the Sorcerer Hat. It’s gone now from DHS. Finally, the DJ started playing the Wobble! And you KNOW I can’t miss that! (Or Cupids Shuffle!) So we joined literally everyone and participated in a massive dance! 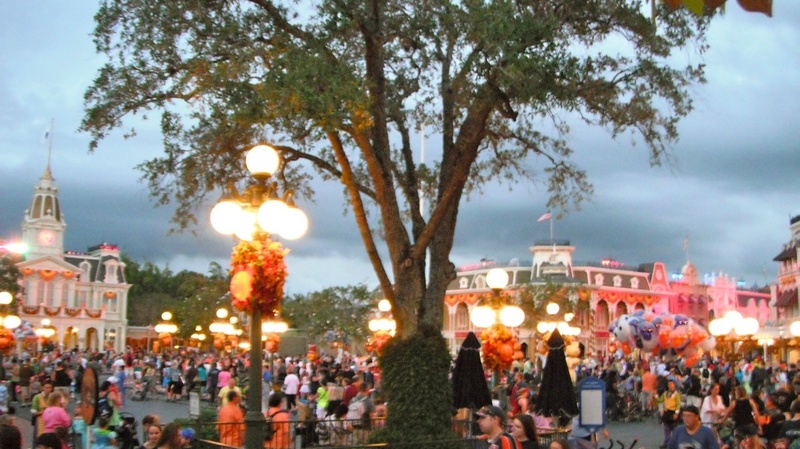 By 9pm, they told everyone to head outside for a dessert party! Out on the front of the building, they set up long tables filled with all these tiny desserts! There were little meringues (I thought they were s’mores, boo), fruit custard shooters, dark chocolate domes, pineapple upside down cake, and a gluten free cookie option. I really don’t like lemon things, so I wasn’t a fan of the first two. I REALLY liked the chocolate except as I was eating, I realized my mouth was on fire! I think they put cayenne pepper in it! There was also really good juice called “blast from the past” punch! Once our friends left, Elly and I were just talking to ourselves and we were totally surprised when people started coming up to talk to us about our book and blog! A couple guys wanted selfies with us – which I totally loved! The nice things people say about Two Girls and A Mouse Tale book & blog really means so much to me! I really take it to heart when people say we were helpful! After around 25 minutes, Elly and I left to get home. It was after midnight and we were exhausted since we were up so early! We headed back to our resort to turn in for the night. Busy weekend ahead of us! Mr. & Mrs. Easter Bunny at their pretty meet & greet at MK. Spring flowers everywhere! 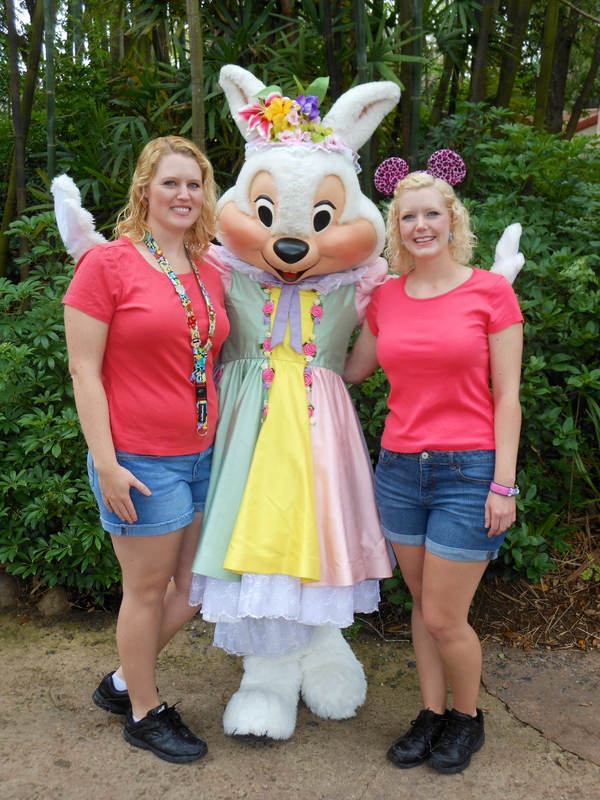 The Easter Bunny and his wife are at Disney World! How cute is this??!! You can meet them at the Magic Kingdom at the meet and greet near the flagpole on Main Street USA. And, on Easter Sunday, they may hop on over to another park! Last year, they were out at Animal Kingdom on Easter Sunday. But, you had to be quick as they were only there from 9am – 2pm! 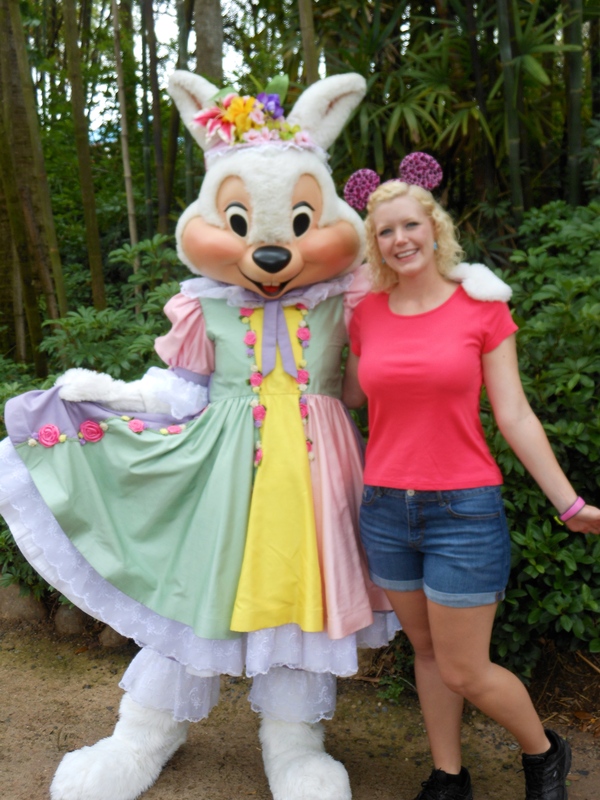 Meeting the Easter Bunny on Easter Sunday at DAK. Mrs. Bunny is wearing an Easter bonnet! Don’t you love her dress? Mrs. Bunny is so precious! The Easter Bunny brought candy for all the good little girls and boys! I got some Easter candy too! Yum! Meet Mr. and Mrs. Easter Bunny from 9:00 am – 6:00 pm March 14-27, 2016. 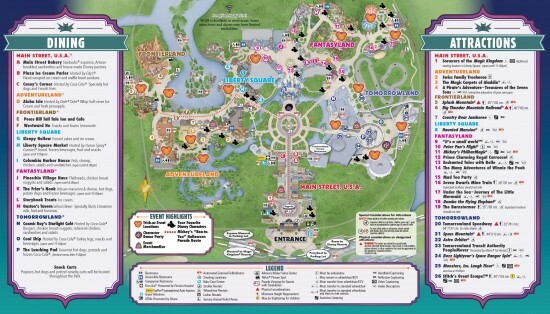 Town Square area – Magic Kingdom admission required. PhotoPass photographers will be available. Epcot is huge and can handle huge crowds. It helps that there are few rides, the crowds are older, and most people just stroll around (especially the World Showcase) taking in the sights and doing food/wine sampling. 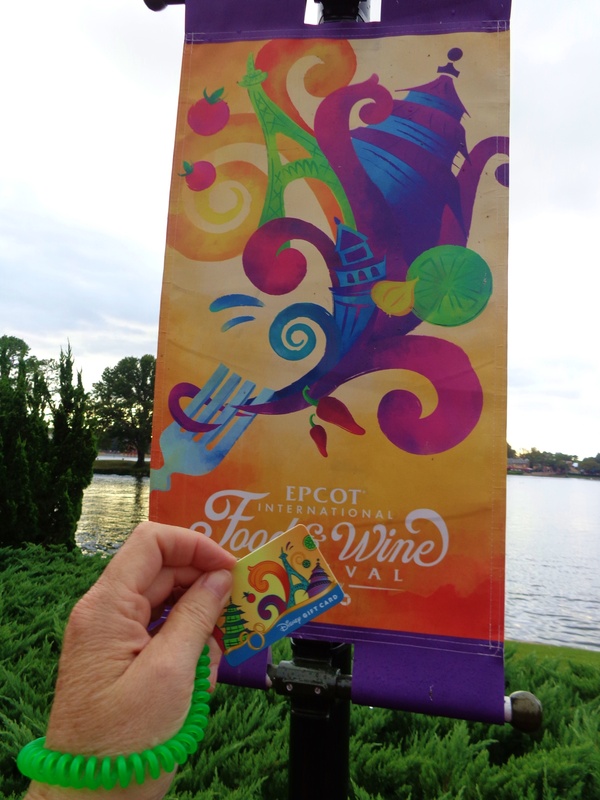 Even for the very popular Food and Wine Festival in the fall, which lasts for 10 weeks, only a few Saturdays in October and November are blocked out for using CM guest passes. Just a few Saturdays in October and November are blocked out due to the Food & Wine Festival. Our mini gift card! Bring at least $100 to the festival! Smoke can be seen coming from under the elephant float. A fire happened today (March 21, 2016) during one of the afternoon performances of the Festival of the Lion King in the new theater at Disney’s Animal Kingdom. The new Harambe Theater in Africa, home of the Festival of the Lion King. About 1,000 people were evacuated from the attraction after the electrical fire started under the elephant float, one of the show’s four large floats. The fire department was called, but the fire was out before they arrived. No one was injured during the incident. The next afternoon performance was cancelled and the first show tomorrow may be cancelled as well. Guests who were evacuated were given a free fast pass ticket for another attraction. The cause of the fire is not yet known.